Convenient all-in-one Air Velocity Kit is small, light and easy to use. No set-up or leveling needed. Digital manometer reads from 0-20 in. w.c. with ±0.5% F.S. accuracy. The Series 477 stores up to 20 readings in memory for later reference, instantly selecting up to nine English/Metric pressure units that are visible on a large, backlit 0.4" LCD readout. Both audible and visual overpressure alarms and a “low battery” warning are standard features. Each kit includes convenient telescoping Pitot tube, Model 166T which is fully adjustable from 11.5 to 36 inches (29.2 to 91.4 cm). In addition, two static pressure tips with magnetic mountings measure pressure drop across filters, condenser coils, etc. Kit comes complete with rubber tubing, 9V battery, step drill, AV calculator slide rule, and custom fitted carrying case. An indispensable test kit for the plant engineer, industrial hygienist and HVAC technician. Ships from stock. 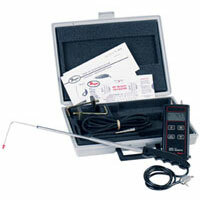 Model 477-1 Digital Manometer, range 0-20 in. w.c.